A few quarters ago, a press conference on the financial results of State Bank of India (SBI) paused comically after a chunk of plaster fell on the stage from above. Smirks in the audience indicated they had taken this as a metaphor for the deteriorating bad loan situation. Stretching that metaphor, can we say SBI’s book is on the mend like the auditorium—the venue for that conference—that is under renovation now? On the face of it, the numbers for the third quarter resemble a chess board as for every positive metric, there is a negative one. The largest lender’s slippages remained around Rs10,000 crore, unlike many of its peers, which showed a decrease. But upgrades surged, indicating stress has eased. Note that this improvement is despite the demonetisation blow to the asset side. Of course, the bad loan ratios, both gross and net, rose simply because of the measly 4.2% loan growth. But for ugly bad loan ratios, two heartening numbers are the sequential reduction in stressed assets ratio (which is gross bad loans plus restructured standard assets) to 9.54% and a fall in credit costs to 1.92%. Further, more than 70% of slippages are from the watchlist that SBI put out in March, which means the lender has got its diagnosis right on toxic assets. The list itself is down 31% to Rs17,992 crore, which represents just 2.66% of the total corporate loan book. The management’s outlook for its asset book is anything but sanguine and the stock movement this year suggests even investors have not abandoned caution. SBI shares have risen 12% this year; but so have the benchmark indices. Arundhati Bhattacharya, chairman of the bank, hopes loan disbursals will grow 6.5% in 2016-17. The loan growth for FY18 is pegged at 11% and that, too, on the base effect, given this year’s limited growth. Bhattacharya also pointed out that demonetisation has set the bank back by a quarter in mending its bad loans. Its mid-corporate and small and micro enterprise customers were the worst hit by the currency withdrawal, and bad loan ratios rose sharply. Moreover, as Emkay Global Financial Services Ltd points out, SBI used the Reserve Bank of India’s (RBI’s) special dispensation to classify loans worth Rs2,000 crore as standard in the wake of demonetisation. Ignore the one-time relief and SBI’s already formidable stock of bad loans at Rs1.08 trillion would have increased further. The bank highlighted that fresh loans disbursed by it are to corporate entities having a rating above ‘A’ and that a slow but sure pick-up in economic activity would eventually translate into higher credit growth. 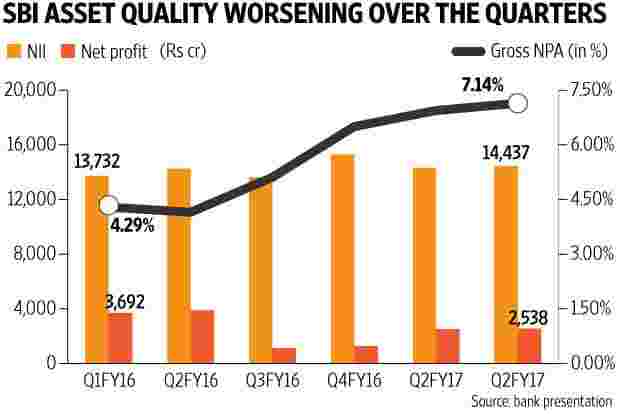 But for FY17, asset quality will look nasty, and the only saviour for the stock is that it currently trades at 1.27 times the estimated book value of FY18 earnings, which is cheap.